Have you ever wanted to do something and known it was exactly what you needed to do, but in the moment you freeze and end up saying no? That’s exactly what’s happening on your sales calls. Your first job is to step up and help your person move through the fear and uncertainty. To help them to make the right decision for them. The key with any questions asked is to simply listen. To hear what’s being said, but also what’s NOT being said. * Prequalify your potential clients. * Goal is not to hear a yes. Goal is to hear what is true. I used to think that what i have to offer is not of value. Now i just think that they don’t make it a priority. No means no to me so I stop. But, I always wonder WHY? Just solve one problem! I need to remember this! 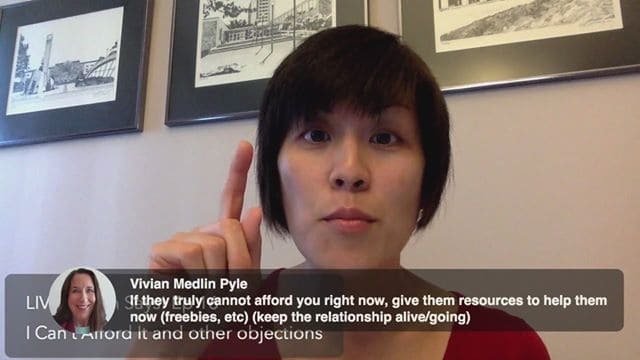 Another one I need to remember: I’m not hearing objections because of my price.